Phil saw this at Chippewa County Fairgrounds in Michigan's Upper Peninsula, and provided another photo to demonstrate that the quotation marks may be, in fact, correct. 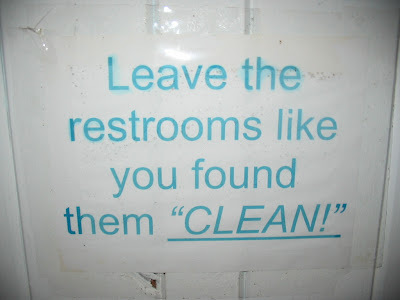 this reads as "Leave the restrooms as if you had found them clean," meaning (to me) "pretend they were clean when you got here," and further meaning "look what a mess you made." I've been checking this blog daily for months now, and this is one of my favorite comments EVER. "Look what a mess you made." I love it! 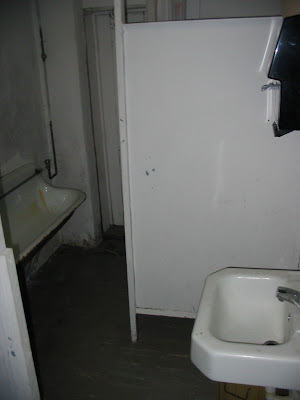 "Leave the restrooms pretending you found them clean." It's a threat. Do as you're told and no one will get hurt. Seems like perfectly legitimate use to me! After I brainwash myself into thinking the restroom is clean, I can go pee in that trough. I love the extra "clean" photo.